When it comes to racing a full distance triathlon, there are no questions about the grit, perseverance, and toughness one has to maintain to make it to the finish line. When it comes to professional triathletes, they have to worry about their body’s well-being, so when their race day isn’t going their way, it is not uncommon for them to drop out. 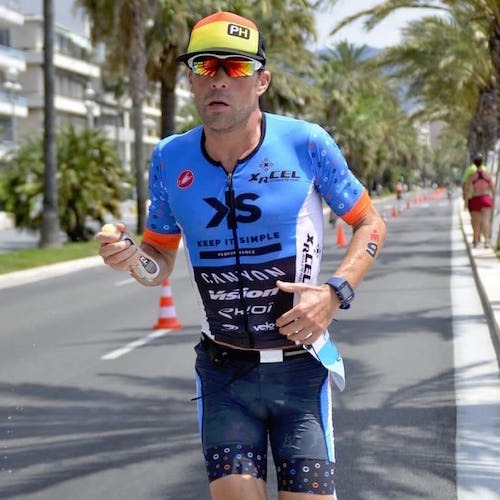 Thanks to the extended release glucose in XRCEL, and a lot of determination, our sponsored pro triathlete, Scott DeFilippis overcame what could have been an unsuccessful ending to his race. Instead, DeFilippis got a second wind, with XRCEL fueling the entire way, and turned in a superb run at Ironman France. In our latest interview, we caught up with DeFilippis to find out how, after a disappointing start to his race, he found the will, and the legs, to run the second fastest marathon split of the day on one of the toughest courses around. XRCEL: You had the second fastest marathon time overall, 2:45:59. After what you considered not to be your best swim and bike, how did you pull off such a fast run? Scott DeFilippis: It’s been a long time since I’ve had a marathon like that, but with nearly a year of uninterrupted training, I knew no matter what happened in the first half of the race, I had that sort of effort in me. I carried two XRCEL’s out of T2, drinking the first immediately and then sipping off the other one during the first 21 kilometers. The Nice course is a four-lap run, so I was able to stop on laps two and three to get the other two bottles I had left in my special needs bag. Last year you were injured and watched Carrie Lester race Ironman France from the sideline. How did spectating last year propel your personal goals for this race? This race is very special for me as it’s the site of my very first Ironman finish. Ever since that day in 2010, I’ve dreamt of running like I did this year, but I was zero for three in previous attempts, completely melting on the run. This year, my main objective was to have a good marathon. Watching the race last year was motivating, but it was also very educational to watch as I saw how the race unfolded and witnessed many of the guys buckling on the marathon. Coming off the bike this year, even though I had lost a good 15 minutes more than I had expected, I knew if I could nail the run, I’d finish in the top 10. First of all, my entire family was there. They came “across the pond” to celebrate my parents 50th wedding anniversary. Trust me, I contemplated pulling out nearly the entire bike ride as I had not had a bad day like that on the bike all year, but I kept thinking of my nephews and I didn’t want to have to explain to them why I quit. Secondly, I knew with a top 10 finish, I would earn a paycheck and, as a professional, as hard as it is to make a living in this sport, I was fighting to cover some costs of the trip. Finally, in terms of beating up my body, I knew the distance of the Ironman, and the marathon, wouldn’t beat me up as it has over the past few years when I didn’t have such a big base of fitness. How does being a coach to your KIS athletes play a role in how you react during your races, whether things are going well or poorly for you? This is a special point in my career because I am still racing at a high level while I continue to hone my coaching skills. With every training block and race I learn something new. Ironman France was no different and hopefully I proved to my athletes that triathlon is three sports, it’s not all about the bike, like many think. At the end of the day, the marathon makes or breaks your race. You have lived and trained in Switzerland regularly over the years. What makes training and racing in the region so special, in your opinion? This is my eighth summer in Switzerland, so naturally it feels like a second home. I absolutely love riding my bike in the Alps as it makes me feel like a little kid when I ride here. There’s nothing like coming to the crest of a mountain and then flying down the other side. You get that same sensation of skiing, only on a bike. Racing here is also very special! So many races around the world have become too easy, with two and three lap bike courses without a hill in sight. This may sound harsh, but some of these races should be called “Easyman” not Ironman, but not in France. The French people are not afraid of a challenge. Every weekend, all summer long, there are races where the organizers found a body of water and then looked for the biggest hills or mountains to make the bike as challenging as possible. They are passionate about suffering, that’s for sure! I think their country’s history, having fought two World Wars here, could have something to do with this mentality, and I plan on racing in Nice again next year! What’s your next big goal for the season and what will you take away from this race? I’m pretty certain I felt so terrible because of how I tapered for this race, so I am currently working this out. Next up will be Alpe d’ Huez Long Course in early August, followed by the “Grand Daddy” of all full distance racing, Embrunman in mid-August. I also plan to race Ironman Chattanooga at the end of September. I’ve recovered well, so I know I have a few big efforts left in me this season. I’ll be swinging for the fences in every race I start until the end of the year!